CLASSIC DOG DAY AFTERNOON: Today’s weather is just what you expect in early August in Alabama. It is hot, humid, the sky is partly sunny, and we have a few random, scattered storms in progress during the heat of the day. Most of the storms are over North and West Alabama, they are moving very little, and will dissipate once the sun goes down later this evening. Where rain is falling, temperatures have dropped into the 70s; away from storms we are seeing low to mid 90s. REST OF THE WEEK: Not much change tomorrow; partly sunny with a passing afternoon storm in a few spots… the high will be in the 91-95 degree range. Then, Wednesday through Friday, we expect an increase in the number of showers and thunderstorms as the upper ridge over the region weakens, and the air becomes more unstable. The chance of any one spot getting wet Wednesday is 50/50, rising into the 60/70 percent range Thursday and Friday. Heat levels will come down; the high Wednesday will be close to 90, then down the mid to upper 80s Thursday and Friday because of clouds and showers. 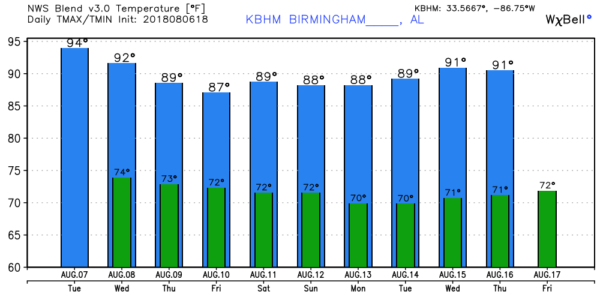 THE ALABAMA WEEKEND: Looks like fairly typical summer weather Saturday and Sunday… a mix of sun and clouds each day with “scattered, mostly afternoon and evening showers and thunderstorms”. Chance of rain for any given location will be in the 40/50 percent range both days, and highs will be generally between 87 and 90 degrees. Best chance of a passing storm comes between 1:00 and 11:00 p.m.
NEXT WEEK: We will continue to roll out the standard summer forecast for the week; partly sunny days with random, scattered showers and storms around during the afternoon and evening hours. Highs will be between 87 and 92 on most days… see the Weather Xtreme video for maps, graphics, and more details. TROPICS: A small disturbance in the Central Atlantic has a 30 percent chance of development over the next few days, but it is moving north toward the colder water of the North Atlantic, and is no threat to land one way or another. 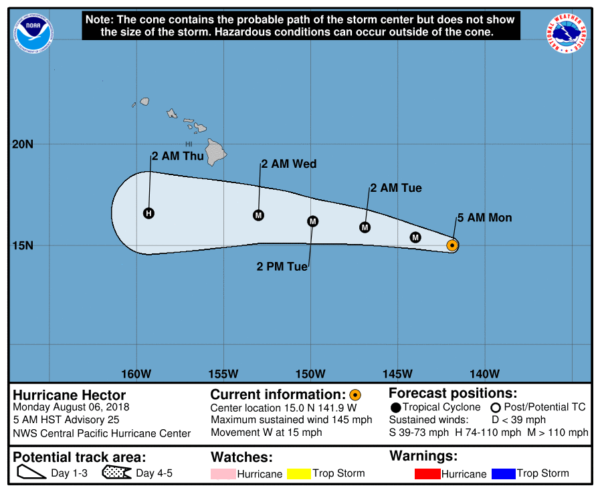 In the Pacific, Hector remains a major hurricane with sustained winds of 145 mph… it is still expected to pass south of the Hawaiian Islands later this week. WEATHER BRAINS: Don’t forget you can listen to our weekly 90 minute netcast anytime on the web, or on iTunes. This is the show all about weather featuring many familiar voices, including our meteorologists here at ABC 33/40. We will produce this week’s show tonight at 8:30 CT… you can watch it live here.